IDI continuously maintain network of contacts with many governmental organizations, research institutes or engineering firms that we have built through various past business relations or survey trips over decades. On the other, as a member of International Water Resources Association or Road Engineering Association of Asia and Australasia, IDI join in annual international conference to collect information and exchange information or opinions periodically. IDI work as the secretariat for the IFNet, International Flood Network, that is one of the natural disaster mitigation programs. It has been co-operated by many countries aiming to promote activities that will contribute to reduce the negative impacts of floods all over the world. Also, IDI control and operate GFAS, Global Flood Alert System, that displays the global flood risk map with color coding based on rainfall probability using the global rainfall data observed by satellites. * GFAS II (ver.2.1) has been released and operated from June, 2017. Based on the official requests by developing countries, IDI dispatch study teams in order to carry out project formulation through information collection & consultations with local governments. 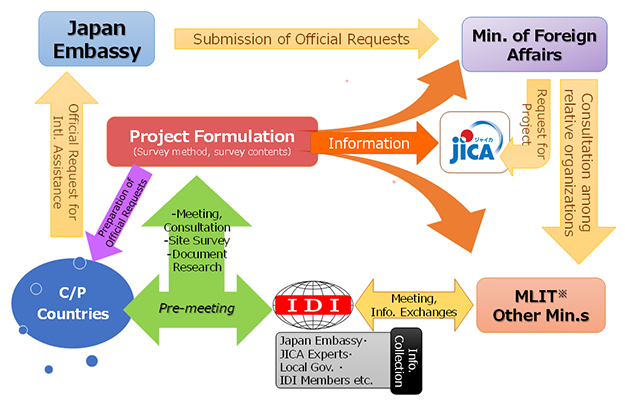 Thereafter, we continuously promote the realization of projects through reporting the result of the study to JICA and/or MLIT. IDI collect various types of domestic and international construction relating news, send out information on Japanese leading-edge construction technologies to foreign countries. By contraries, deliver information for IDI members on the existing construction industry situations or demands for technical or financial assistance by developing countries. iii) Hold Seminars or Deliberations with Other Bodies, JICA etc. 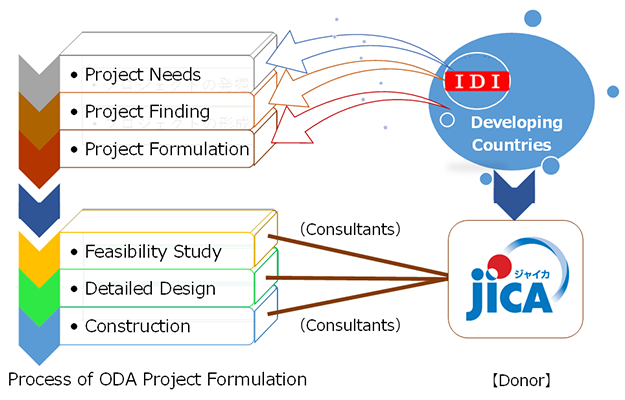 IDI often hold seminars which deal with overseas information in the field of civil engineering, carry out overseas investigations or researches with consulting firms as well as construction firms as necessary and exchange opinions with JICA. IDI plan and carry out training courses relating to international cooperation or lectures for the purpose of human resource development especially for member firms. IDI offer distinguished service awards, “OZAWA KAIGAI KORO-SHO” for people who have been recognized his/her invaluable international contributions in the past. IDI deliver lectures for attaches or JICA experts regarding IDI’s support menu and outline of overseas activities of IDI’s members before leaving Japan and exchange information with them. Through issuing annual research magazine by the Research Center or active participation in international meetings, IDI promote personnel training. IDI provide periodical in-house magazines such as “Kokkenkyo JOHO” for IDI members, “IDI Quarterly” for overseas by e-mail. Copyright © 2019 IDI-JAPAN All rights Reserved.